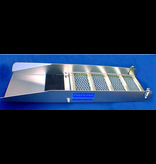 The PROLINE Large Sluice Box is a "Must" for all Prospectors. The ideal prospecting tool for the "week-ender" to the "professional." Produces quantities of concentrates faster than panning. Improved riffle design for superior recovery for all conditions. Black rubber ribbed matting for instant gold recognition and improved fine gold recovery. Improved riffle latching system for easier and faster clean up. Lighter and more compact for packing and storage. Improved handle for better balance & ease of carrying. Plated expanded metal welded under the riffles causes turbulence to drop values. 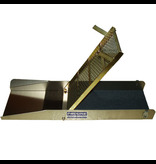 High profile carpet under the expanded metal captures even the finest gold. Designed with a wider flare for faster separation and longer for greater capacity. The flare is detachable for storage and packing. Easily balanced for carrying. Size 10" x 50" with a large flare. Riffle area is 10 inches wide and 30 inches long. Weight 11 lbs.